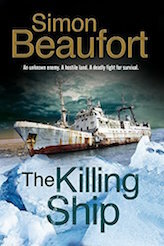 Simon Beaufort is the pseudonym of Susanna Gregory and Beau Riffenburgh when they write jointly. Together they have written eight Geoffrey Mappestone novels and contributed to several Medieval Murderer books. Recently, they have ventured into more modern times – The Nimrod Murders is set in early 20th century London, and The Murder House takes place in 21st century Bristol. Goodrich Castle in Herefordshire is one of our favourite castles. We were sitting in it one day, enjoying its ancient stones and the excited babble of children exploring them, when the idea came to write a series about someone who might have lived there. Research showed that the name Goodrich came from ‘Godric’s Castle – Godric Mappestone or Marplestone held the manor shortly after the Norman Conquest. Nothing more is known of him, but he was probably a knight who had been given the lands for supporting William the Conqueror. He might have been a Norman who accompanied the Conqueror, or a native who knew on which side his bread was buttered. Regardless, we decided that our protagonist would be Godric’s son. As nothing is known about Godric’s family, we had to invent them. We married him to a woman named Herleve, and gave them four sons (Walter, Stephen, Henry and Geoffrey) and two daughters (Joan and Enide). As the fourth son, Geoffrey’s chances of inheriting anything were slim, so he was sent to nearby Gloucester Abbey – a convenient depository for landless younger children who needed to make their own way in the world. However, Geoffrey was patently unsuited to a life of monastic obedience, so he was packed off to be trained as a warrior instead. Eventually, he came into the service of Tancred de Hauteville (1075–1112), later Prince of Galilee. When Tancred embarked on the First Crusade of 1196–1199, Geoffrey went with him, although he had no stomach for the bloody slaughter, particularly at the end when Jerusalem was taken. The first book in the series takes place in 1100, shortly after the Fall of the Holy City, when an uneasy truce exists between the invaders and those residents who were not slaughtered in the fighting. These are Simon Beaufort’s mysteries, listed in order of publication. Click on the title for more details. In the bloody aftermath of the Fall of Jerusalem, a quiet knight is murdered. Sir Geoffrey Mappestone is ordered to catch the culprit, but his investigations draw him dangerously close to the powerful men who are squabbling for control over the captured city. Sir Geoffrey returns to Goodrich after an absence of twenty years, longing for a respite from war and turmoil, but he soon discovers that his birthplace is even more turbulent than the Holy Land, especially after his father claims he is being poisoned. When the treacherous Bishop of Durham escapes from the Tower of London, Geoffrey and his friend Roger – who is the Bishop’s son – must travel north in search of a killer who threatens the stability of the entire country. Robert de Bellême is one of the most feared and hated barons in the known world. When Geoffrey and Roger witness the murder of his illegitimate son, they are drawn deep into a world of treachery, deceit and violence. King Henry loves money, so when there is a whiff of trouble in the royal mints, he orders Sir Geoffrey Mappestone to investigate. The trail leads Geoffrey to Bristol and Bath, where they discover sinister and deadly forces at work. When Geoffrey’s only surviving brother is found dead, he becomes heir to Goodrich Castle, but his inheritance brings challenges not only from those who would wrest it away from him – by murder if necessary – but from the daunting prospect of a politically advantageous marriage. Determined to return to the Holy Land, Geoffrey buys passage on a ship, but it sinks in a storm, casting him up on a beach near Hastings. Among the other survivors is a Saxon who aims to overthrow King Henry and seize the throne for himself. Can Geoffrey avert a rebellion before someone stops him – permanently? Helen had no idea how her life would spin out of control when she met an old schoolmate a number of years after they had graduated. The unexpected meeting proved disastrous for her – but fatal for him. What could she do? How could she hide the past? And what further dilemmas would the future bring? When marine biologist Andrew Berrister sees a pod of blue whales off Livingston Island in the Antarctic, little does he know that their days are numbered due to an illegal whaling ship even then approaching their previously safe haven. But the dangers shift to Berrister’s small party when the whalers start trying to make sure the scientists aren’t alive to tell of the whaling … or even more horrible actions. 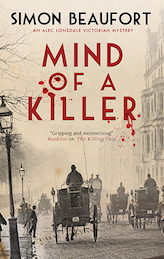 When reporters Alec Lonsdale and Hulda Friederichs of The Pall Mall Gazette begin to investigate a series of murders in London, they find obstacles placed in front of them by both the police and their own editor. But a series of attacks on them convinces them they are on the right track – if only they live to follow the case to its conclusion.